The Tainan Municipal Baseball Stadium is home to the Uni Lions. The Tainan Baseball Stadium is home to the Uni-President 7-Eleven Lions of the Chinese Professional Baseball League (CPBL). Catching a game there is a fun experience for any fan of baseball, or anyone who wants to experience local sports culture. 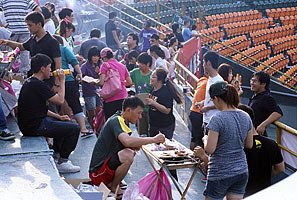 Taiwanese love their baseball, and it is easily considered the national sport. The games are lively, fun, and filled with a lighthearted atmosphere that you just don’t get in Major League Baseball. Taiwan’s baseball has an unpretentious, “past time” feel that you can still get in minor league games in North America, but CPBL games have a lot more energy and fan dedication. The CPBL offers an entertaining level of play similar to Double-A or Triple-A Baseball in North America. Many people who are casual fans may simply find interest in the cultural differences of the game. Much like in Korea or Japan, baseball here is full of subtle cultural twists on what is basically the same game played throughout North America. Any visit to the snack bar will be proof enough that you’re not in Kansas, but the style of cheering is the most glaring cultural difference in my opinion. Instead of random blurts like “C’mon, Henderson!” and “You bum, Giambi! Earn your money!” that you’d get at an MLB game, the fans in the stands in Taiwan all happily chant and cheer in unison. The cheering is nearly constant throughout the game and only altered by the tempo of suspense or the chaos of an exciting play. The chants are led by organized ‘cheer leaders’ and are accentuated by a variety of noise makers. The most common noise-maker is a pair of plastic percussion cones that are beaten together. A purchase of a set of these will truly add to your Taiwanese baseball experience. It would also be enlivening to learn some common chants. You may already know the all-purpose jiā yóu (加油 – literally: add gas) used to say “go, go!” More specific to baseball, you will no doubt hear people chanting quán lěi dǎ (全壘打) for “hit a home run,” or ān dǎ (安打) for “get a hit.” If you give them a try, you’ll feel more in the spirit of the game and you might make some new friends. Inside the stadium, seating is close to the action. The Japanese first brought baseball to Taiwan around 1900, but it wasn’t until 1989 that the first professional Taiwanese league was formed. The CPBL started with just a couple of teams, but the league grew and a second league, the Taiwan Major League, was formed in 1996. The TML, however, ran at a loss and was absorbed into the CPBL in 2003. The CPBL has had nine teams over the years, but after a series of gambling and corruption scandals, fan support dropped and the league now has only four teams: Taipei’s Brother Elephants, Taichung’s Sinon Bulls, Kaohsiung’s La New Bears, and Tainan’s Uni Lions. Only the Elephants and the Lions have been around since the beginning. Tainan’s Lions has been the most successful team, with the highest winning percentage and the most championships of any team. They are the reigning champs three years running. Tainan City also produced pitcher Wang Chien-Ming whose ascent into Major League stardom with the New York Yankees heightened Taiwanese interest in American baseball. This, in turn, may have led to less interest in the CPBL. Tainan Municipal Baseball Stadium was built in 1949 on the grounds of a baseball field built by the Japanese. The stadium underwent renovations during the 1970s and its first lights were installed in 1992. The stadium capacity is 11,000 people. While most of this seating is fold-down, molded-plastic chairs, the outfield seating (bleachers) is made up of cement benches that will turn your bottom into that of a baboon’s if you brave the baking heat without bringing a cushion (cushions are sold at the stadium as well). While the outfield seating is far from play and not as comfortable, it does have the advantage that you can rent barbecues and move around freely. Seating along the baselines is more comfortable, shaded, and quite close to the field. Due to the stadium being in-line with the airport’s flight path, the lights had to be lowered and moved inside of the stadium on the edge of the field. This means they obscure views from certain angles, but it is unlikely they’ll sell you tickets for these seats unless the game is nearly sold out. Unlike most other leagues, the teams in the CPBL don’t play an even number of games home-and-away. There are actually 12 stadiums throughout the island and the four teams take turns playing at different stadiums. While the Lions will always be one of the two teams playing at their home stadium, they only play about 36 games there during the 80 game season. Click here for a glance at the 2010 schedule (Chinese-only). Another big difference in attendance is that stadiums have divided sections for whichever team you’re cheering for. The Uni Lions fans sit on the first base side of the field and the opposing team’s fans sit on the third base side. For most games this means the stadium is filled on one side and nearly empty on the other. Prices for games are NT$300/$200 (adults/concession) for field level tickets, and NT$150 for outfield bleacher seating. They can be bought at the box office on-site, or through ibon machines at 7-Eleven. 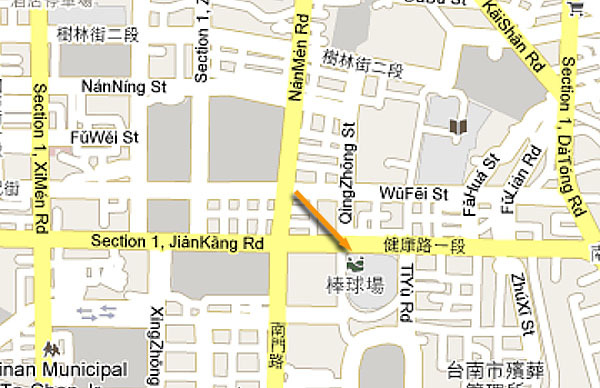 The stadium is located on Jiankang Road, across from the Temple of the Five Concubines and at the entrance of the Tainan Athletic Park.